The RS Feva is the ideal boat for young sailors who want to get into 2-person sailing and racing. 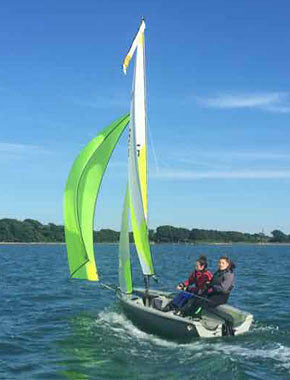 Suitable for sailors aged 12+, and 90-120kg total crew weight (2-person). The Club owns 3 that are available to be rented see the "Renting Club Fevas" page on this website. If you want to move on from the Optimist/SailQube or Topper or simply prefer sailing with company in the boat, the Feva is a great choice. Featuring an asymmetric spinnaker, the Feva is also the boat we use to teach those moving on up the RYA's Youth Training programme beyond Stages 1-4. The Feva is also the standard 2-person junior trainer and is used for the Schools Regatta each year.